However, the set is empty. But you hear a major racket off camera as someone is fumbling frantically with the set’s door. After a few moments of clatter, Bill Flannery, a young announcer, stumbles onto the set, noisily banging a portfolio case behind him as he drags it into the camera’s view. “I told you not to drag that case sideways Flannery", chides his cohort Don Raymond who follows him onto the set. “Well, I am tangled in my mic cord. This is a high-quality show you know," Bill replies. “Don, if you thought last week’s movie was bad, wait ‘till see this week’s. ", Bill says. “It is worse than the movies on Air Wisconsin flights." “They don’t show movies on Air Wisconsin flights," Don counters. “Now you get it." Bill says. Nothing unusual was happening, that was Bill and Don -- and that was the original Acri Creature Feature. To truly understand the creative force behind the memorable program, particularly the earlier programs when the show was at its best, it is necessary to acknowledge the contributions of the show’s original on-air hosts Bill Flannery and Don Raymond. Their zaniness was no accident, it was carefully planned as part of a broader vision they shared since the two longtime friends began working at WQAD-TV in the mid-1960s. Young and talented, these two up-and-coming broadcasters shared a commitment to bringing a distinctive, cutting-edge quality to WQAD programming. As it turns out, they were most successful in this endeavor, and the Acri Creature Feature represents the most visible -- and definitely best remembered -- fruits of their labor. 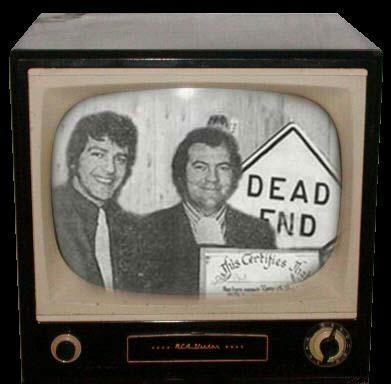 Initially taking the form of three specials in 1969, the program expanded to a weekly format beginning on Halloween night, 1970. During that period, Bill and Don, along with Tom Caldwell, laid the groundwork for a program that would air in multiple localities and be viewed in three states for nearly a decade. Their vision was fairly simple: make the show unique and make it fun. They succeeded royally on both counts. In addition to their behind-the-scenes efforts to cast, direct, and script the program, they are well remembered for their zany on-air antics as co-hosts. It is difficult to really describe their on-air style since it was part talk-show, part commercial, and part weekly house party. But whatever form it took, the viewer was always part of the fun. That factor represents, perhaps, Bill and Don’s most memorable quality: their natural rapport with each other and their ability to connect with the audience. Although hundreds of hosted monster movie shows aired throughout the nation in that era, nothing was quite like the Acri Creature Feature when Bill and Don were in their heyday. Watching the show was like attending a party every Saturday night. I remember waiting all week for the fun to begin, then spending Sunday with my friends discussing what we had seen the night before. Throughout sizeable chunks of eastern Iowa and western Illinois in 1970 and 1971, enduring awful grade B monster movies that were punctuated with sheer merriment represented a weekly ritual—a fondly remembered ritual that was repeated each week in countless homes. It is safe to assert that, across the nation, precious few local programs of any genre ever impacted with the same effect and to the same degree. Within weeks after Bill and Don inaugurated the weekly program, WQAD was flooded with letters. Enthralled with the campy movies, hilarious vignettes, and zany commercial breaks, viewers could not get enough of the Acri Creature Feature. Soon those letters became a regular part of the party and, eventually, were highlighted by the longstanding Creep of the Week Award. Now the program is a vital part of Midwest television history. "The thing that any of us who were connected with the show were the MOST proud of was that the Creature Feature was pulling audience ratings that for a late night weekend time slot were unheard of...Molander and Gibson were the core reason for the entire success of the Creature Feature." - Bill Flannery. "While at WQAD, Bill and I were involved in a lot of the creative efforts aimed at improving the station. As the newest TV outlet in town, very few gave us much of a chance to make an early impact. We quite literally fooled them all." - Don Raymond. Please continue to read in-depth details about the creation of the Acri Creature Feature television program straight from the mouths of Bill Flannery and Don Raymond at Rich Birley's amazing site, Captain Ernie's Showboat! Bill Flannery and Don Raymond Producers and hosts of the original Acri Creature Feature. Text & image by Phil from Dubuque. Please do not copy without expressed written consent. Picture this: It’s a bitterly cold, snowy Saturday night in January, 1971. You are twixt 12 and 20 and you live somewhere in eastern Iowa or western Illinois. You have been waiting the whole night—all week, in fact—to see your favorite television program, the Acri Creature Feature. For the past two hours you have endured the Bill Sexton Ford Theater to be sure you don’t miss anything and now it finally is nearing midnight. The show’s intro rolls as you listen to the strains of "Windmills of My Mind" and the camera cuts to Vincent Hedges' familiar living room set.